Yoav Perlman - birding, science, conservation, photography: Great Snipes! This morning I followed up on Eran Banker's observation from a couple of days ago, and visited Hulda Reservoir. 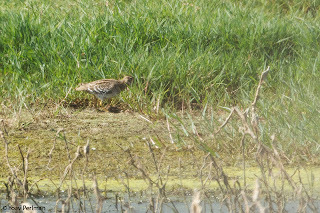 Very quickly I got onto a Great Snipe that was feeding half-open, but very it quickly retreated into the vegetation. 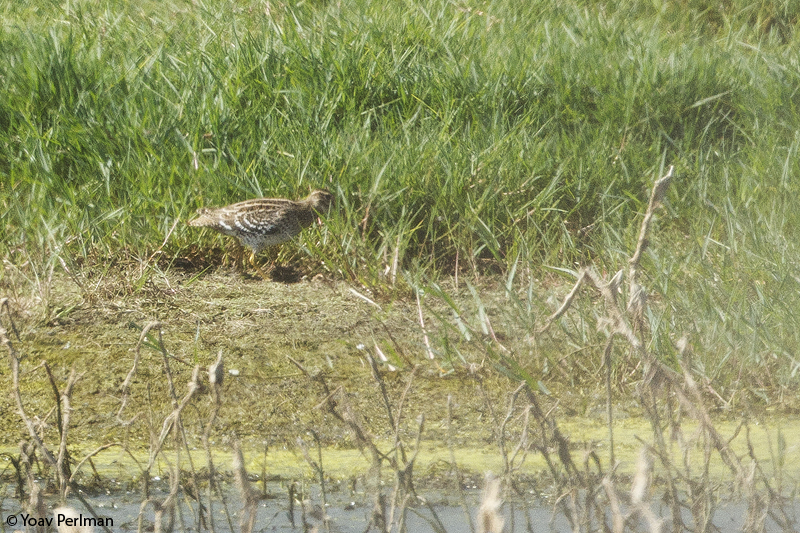 I stayed there for another hour and managed to see four different Great Snipes - this is a very high count for Israel. We normally have singles of this rarity here. However, by the way they skulked today, there may well be even more there. I checked only a small section of the reservoir, where Eran had his. This reservoir is very big, and nearby there are many more similar habitats, so who knows... All the views I had were distant, really not good for photography. Sorry for the poor record shot but I have the best excuses possible - distance, heat haze, through vegetation, into the sun etc. Not too many other birds - one each of White-winged and Whiskered Terns, some common shorebirds and that's it. Thanks to Eran for this great find!